The Chinese dragon represents internal strength. Contrary to popular belief, there is no relation to the Western dinosaur or fire-breathing dragon. Instead, according to Buddhist writings, the Chinese dragon is a mystical creature that can show itself to those he wants, especially to those who have reached the highest levels of enlightenment. Chinese dragons also are said to live in oceans or large bodies of water and are believed to produce rain. They can make themselves large or small, and are sometimes said to be visible within the clouds if you look closely. 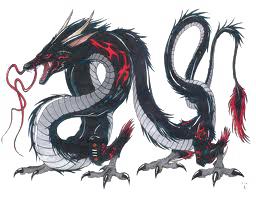 The dragon form combines internal and external energy to produce awesome and devastating strikes. Dragon techniques feature circular movements that can penetrate with sudden explosiveness. Though the claw is the primary hand technique used within the dragon form, there are also various palm and fist attacks that add to the dragon form's effectiveness. However, using the waist in a whipping action to generate power is essential to the development of proper dragon energy. The dragon form uses internal conditioning through proper breathing techniques to develop qi (internal energy). This is done by using the lower body to pull in air with relaxed breaths. The breathing develops flexibility, strength and power.